We’ve all eaten a croissant at one point or another. Or many times. Usually at a bakery, from the grocery store, or as part of a (usually mediochre) “Continental Breakfast”. Sometimes, they are made fresh, but more often than not, they’re made as part of a production line and simply reheated from frozen. When I can find the time, I like to make them from scratch. Yes. Scratch. From start to finish. They’re always better. If I do say so myself. Making croissants are not difficult, but they are time consuming. This is not a recipe you can simply wake up one weekend morning and decide “I want fresh croissants for breakfast” and begin making them. If you put in the work, you could have them the next morning, though. So, in other words, you can start them on Saturday and have them Sunday. As always, a little history lesson. Crescent-shaped food breads have been made in Europe since at least the Middle Ages. The Kipferl – ancestor of the croissant – has been documented in Austria going back at least as far as the 13th century, in various shapes. The Kipferl can be made plain or with nut or other fillings (some consider the rugelach [a filled, rolled pastry of Jewish origin] a form of Kipferl). The “birth” of the croissant itself – that is, its adaptation from the plainer form of Kipferl, before the invention of Viennoiserie (Viennese yeast-risen pasteries) – can be dated with some precision to at latest 1839 (some say 1838), when an Austrian artillery officer, August Zang, founded a Viennese Bakery (“Boulangerie Viennoise”) at 92, rue de Richelieu in Paris. This bakery, which served Viennese specialities including the Kipferl and the Vienna loaf, quickly became popular and inspired French imitators (and the concept, if not the term, viennoiserie, a 20th century term for supposedly Vienna-style pastries). The French version of the Kipferl was named for its crescent (croissant) shape. Alan Davidson, editor of the Oxford Companion to Food (an excellent reference book) found no printed recipe for the present-day croissant in any French recipe book before the early 20th century; the earliest French reference to a croissant he found was among the “fantasy or luxury breads” in Payen’sDes substances alimentaires, 1853. However, early recipes for non-laminated croissants can be found in the nineteenth century and at least one reference to croissants as an established French bread appeared as early as 1850. The first true croissant recipe didn’t appear in print until 1906 in Nouvelle Encyclopédie Culinaire. So, the history of the croissant, as we know it, as a symbol of French cuisine, is a 20-century invention. The Viennoiserie technique was already mentioned in the late 17th century, when La Varenne’s Le Cuisinier françois gave a recipe for it in the 1680 – and possibly earlier – editions. It was typically used, not on its own, but for shells holding other ingredients. But it does not appear to be mentioned in relation to the croissant until the twentieth century. Fanciful origin stories of how the Kipferl—and so, ultimately, the croissant—was created are widespread and persistent culinary legends, at least one going back to the 19th century. However, there are no contemporary sources for any of these stories, nor does an aristocratic writer, writing in 1799, mention the Kipferl in a long and extensive list of breakfast foods. Now in France, croissants are split into two types: “Croissant” – usually meaning croissants made with cheaper ingredients like margarine because butter is so expensive; and “Croissant au Beurre” – croissants made with butter only (or are supposed to be). The most important thing to remember about croissants is that you must start off with quality ingredients – especially the butter. If you can, always use European-style butter (available just about everywhere now). 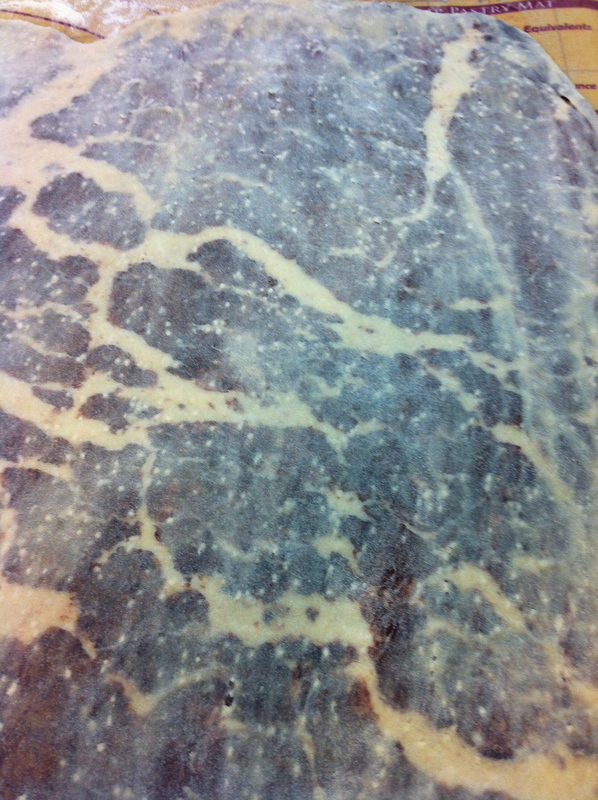 It has a higher butterfat content (generally >80%) and less water than American-style butters (i.e. Land-O-Lakes). This will give your croissants the flavor you are working so hard to strive for. DO NOT use “light” butter or margarine. They are useless for baking; not to mention they taste awful. After all the work you’re going to put into this recipe, you want your croissants to taste great. The same goes for the milk. Use whole milk. Half-&-Half and Cream will be too heavy; 2% or Skim are good for drinking, but lousy for cooking. Always keep your dough and butter cold. The coldness of the butter in the layers will help create the lightness and layers in the dough as it bakes. As the butter melts in during baking, the steam released will help create the flakiness and layers. 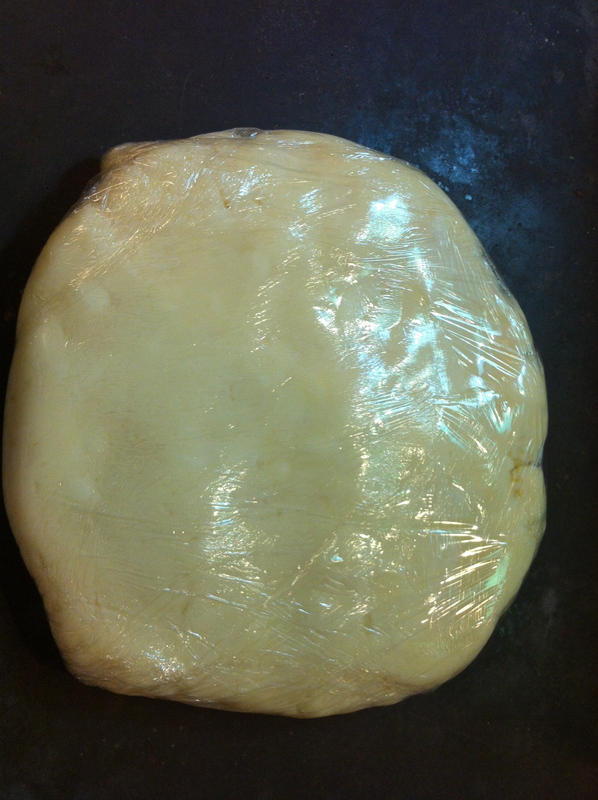 If your dough becomes too soft, or if the butter begins to break through the outer layers of dough, rub a bit of flour into the “wound”, wrap the dough tightly in plastic or place in a large zip bag, and place the dough back in the refrigerator for at least an hour to let the dough rest and the butter harden. DO NOT SKIMP on the number of turns and rest periods. This is a dough that takes time. If you do not take the time, then you won’t get the results you’re looking for. You can freeze already baked croissants. Make sure they are in an airtight container or wrapped tightly. Bake then straight from the oven at 350F for 10 – 12 minutes or until hot through. After much trial and error, I settled on a mixture of all-purpose and bread flour for the croissants. I felt that a recipe of only all-purpose flour made the croissants too soft with not enough body; all bread flour, they were too tough. You can use instant or fresh cake yeast in this recipe. Most home cooks, however, prefer to use dry instant. It keep longer and is easier to use. However, if you bake yeast breads often and are used to it, then go ahead and use the fresh. 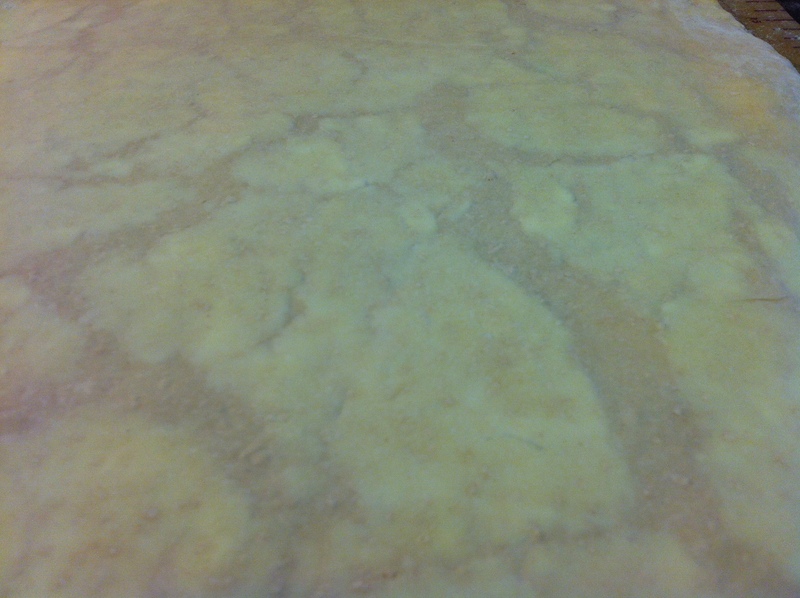 However, it does have a relatively short shelf life compared to the dry. 3/4 c. unsweetened cocoa powder (for chocolate croissants only) – I like to use to use Dutch processed because it has a deeper, mellower flavor. If you have natural cocoa powder and prefer to use it, go ahead. 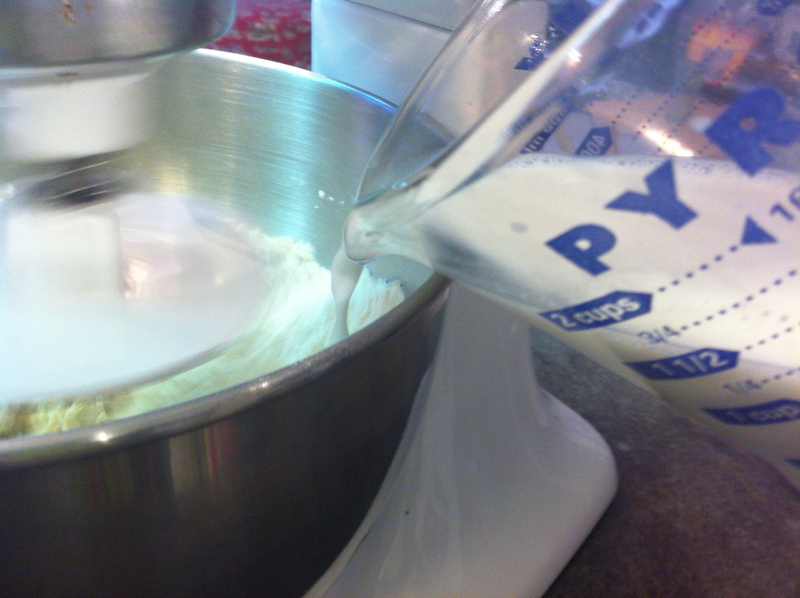 As the mixer is running, slowly add in the warmed milk. Continue mixing the dough on low speed until the dough comes together and forms a ball (trust me, it will), about 5 – 7 minutes. It should be soft, pliable, and a slightly sticky. Resist adding any additional milk or flour unless the dough is too sticky or too dry, otherwise the dough will become too dense. 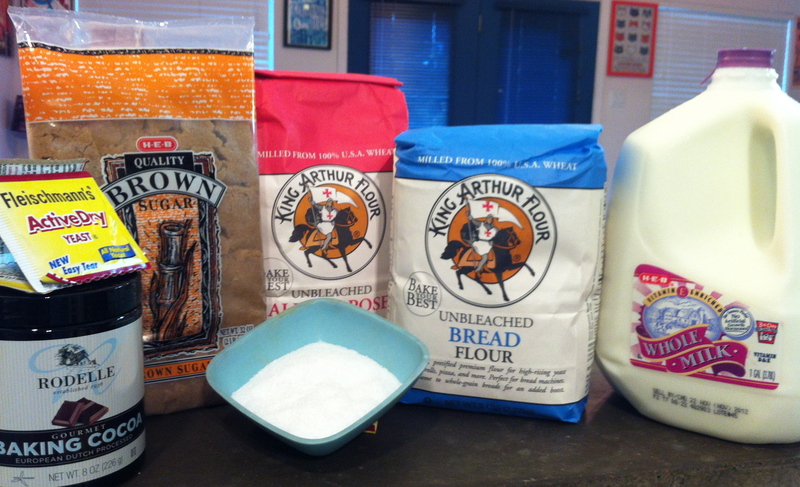 If you need to, add only 1 tablespoon at a time of either. But, like I said, please resist the urge. The dough will come together. 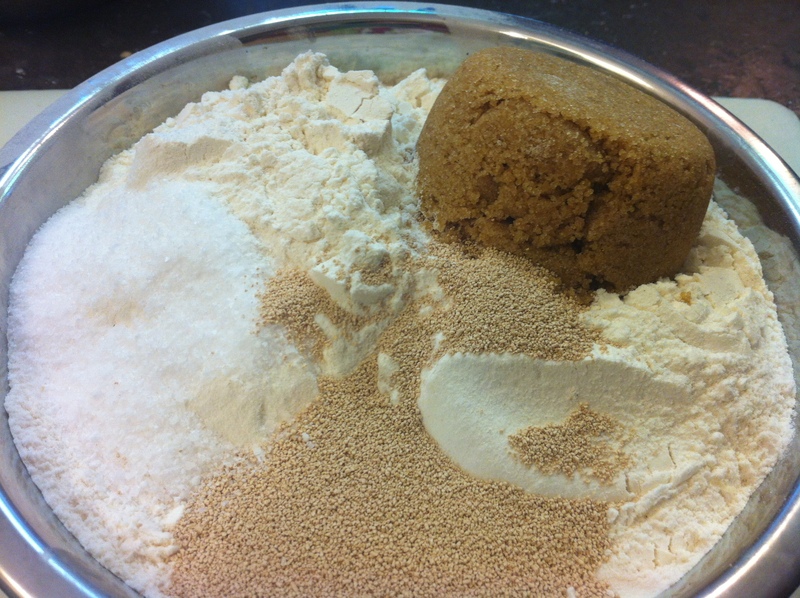 b) By hand – mix together the dry ingredients and make a well in the center. Add the milk to the center to the well in the well. 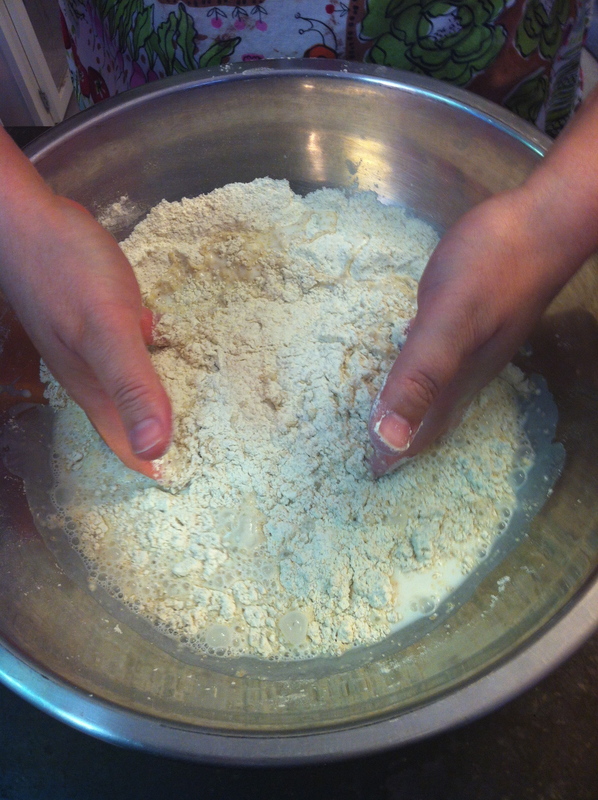 Getting ready to mix the dough by hand. Tossing the dry ingredients and the milk together. This will take a little patience and elbow grease, but mix and knead the dough until it’s smooth and slightly sticky. 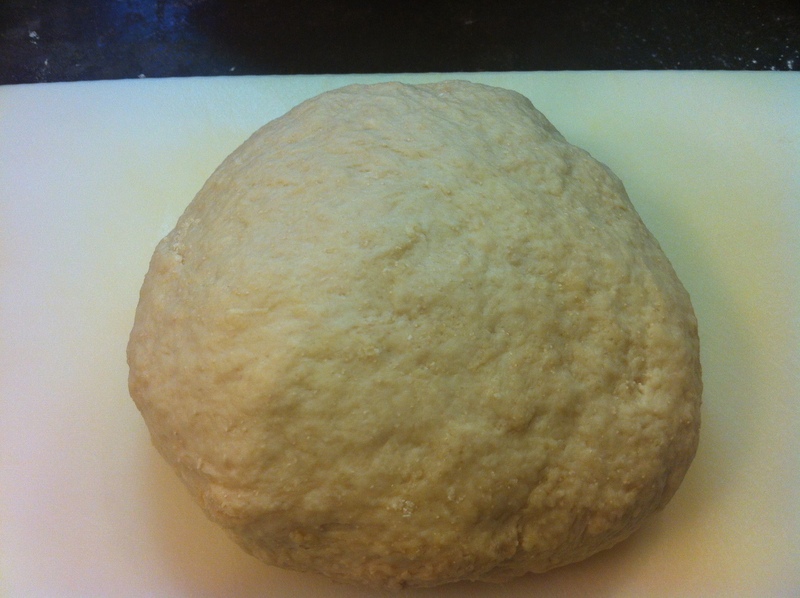 The finished ball of dough. I didn’t add any additional flour or milk. 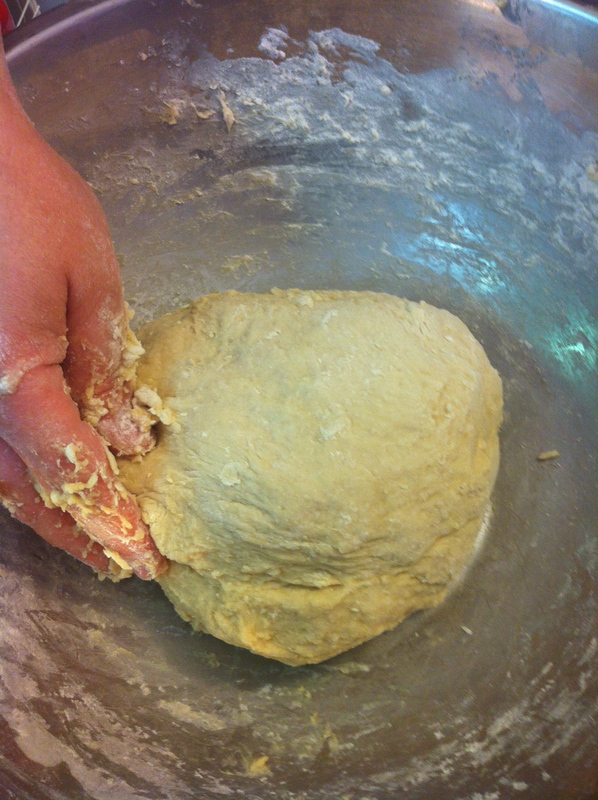 The kneaded dough. It’s a little less sticky. It’s OK if it’s not 100% smooth. You really want the dough to have an even texture. The dough in the bag. 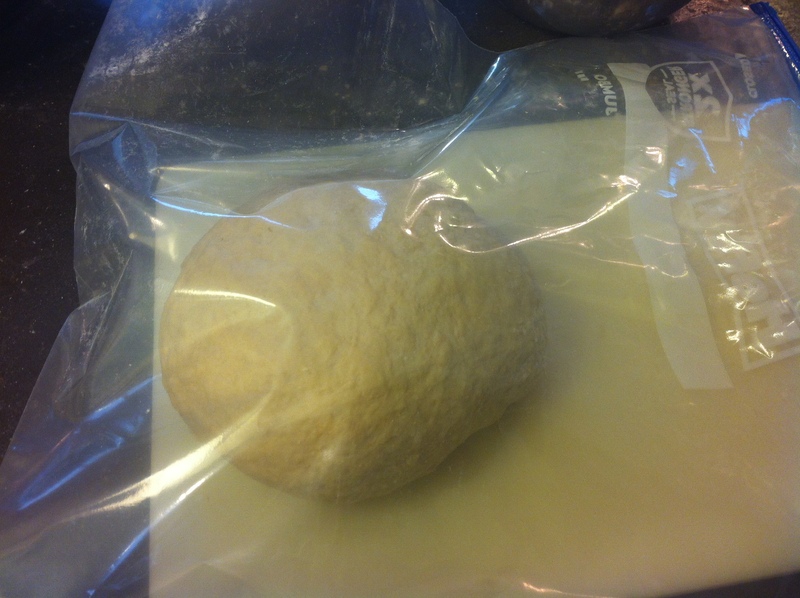 Alternately, you can loosely wrap the dough in a double layer of plastic. 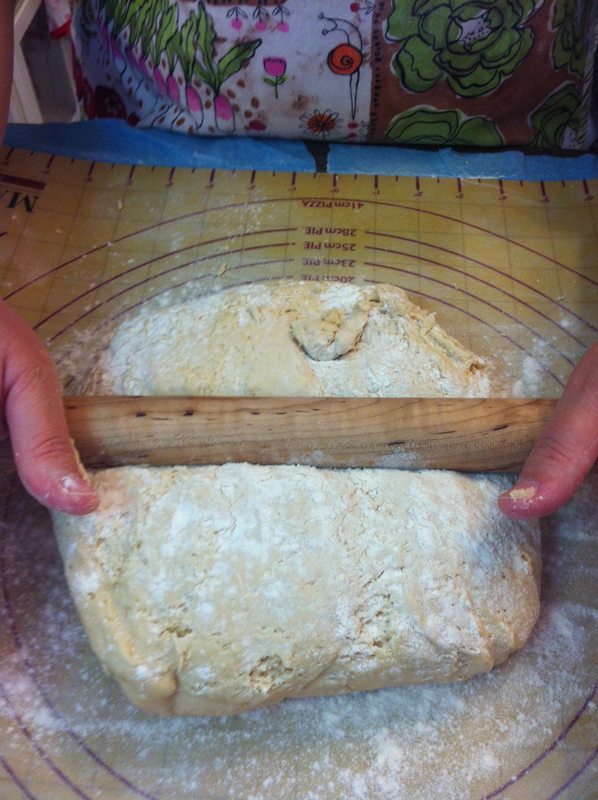 The looseness will allow the dough to expand. However, there is a danger of the dough breaking through the plastic as it rises (it’s happened to me), so I highly recommend the bags. Place the dough in the refrigerator for at least 2 hours or up to overnight. 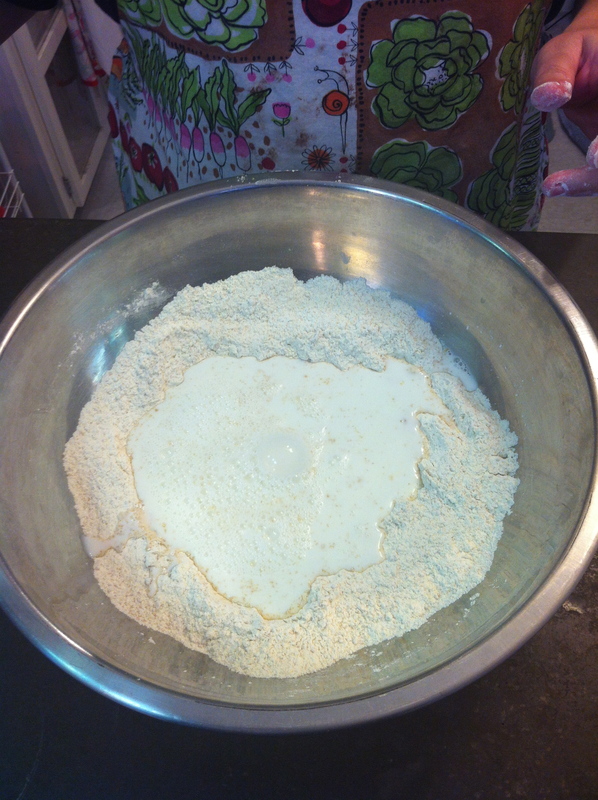 Butter and flour in the mixer bowl. Beat the butter on low speed until the butter is softened . It’s alright if there are a few pieces of butter. It doesn’t have to be perfectly smooth. After beating the butter and flour. It’s softened, but not completely smooth. 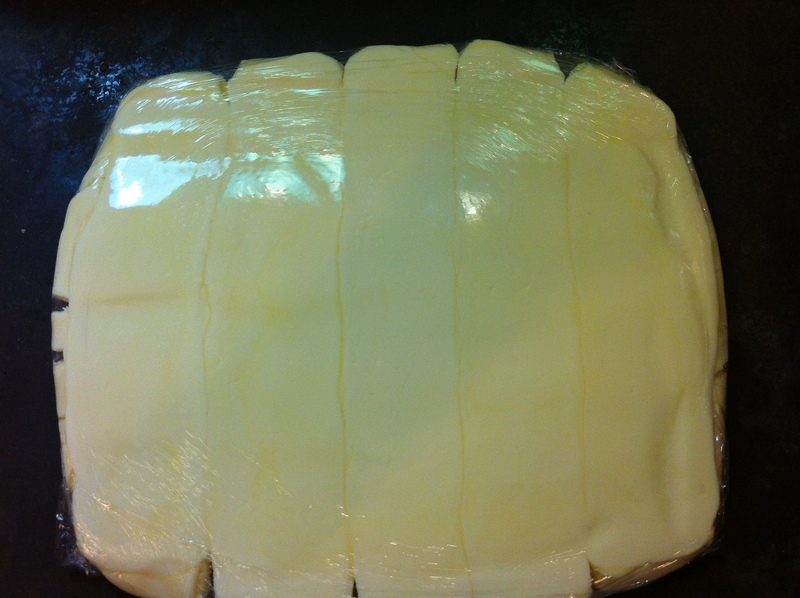 Turn the butter out onto a piece of plastic wrap and form into rectangle or rounded disk that’s about 1/4″ thick. The finished butter packet. Not exactly a rectangle or round. More like a flat egg shape. The butter for the packet. 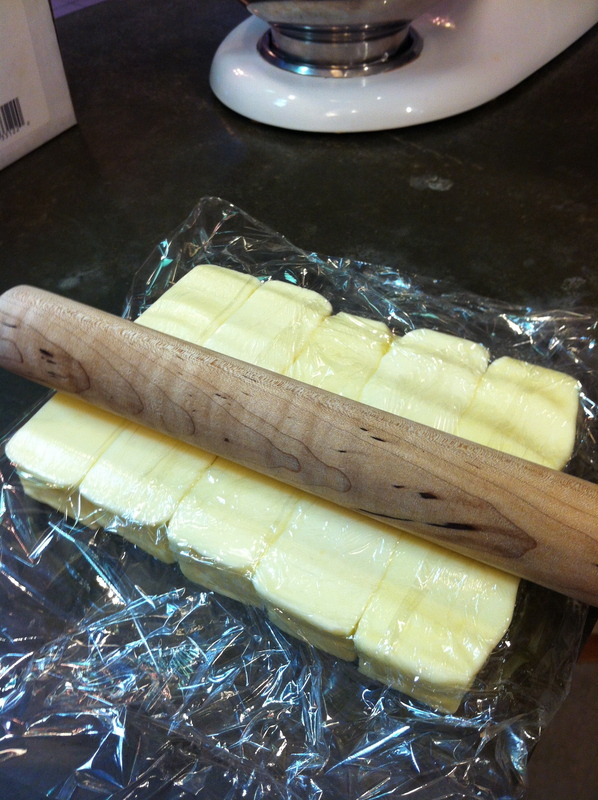 Flattening the butter with the rolling pin. 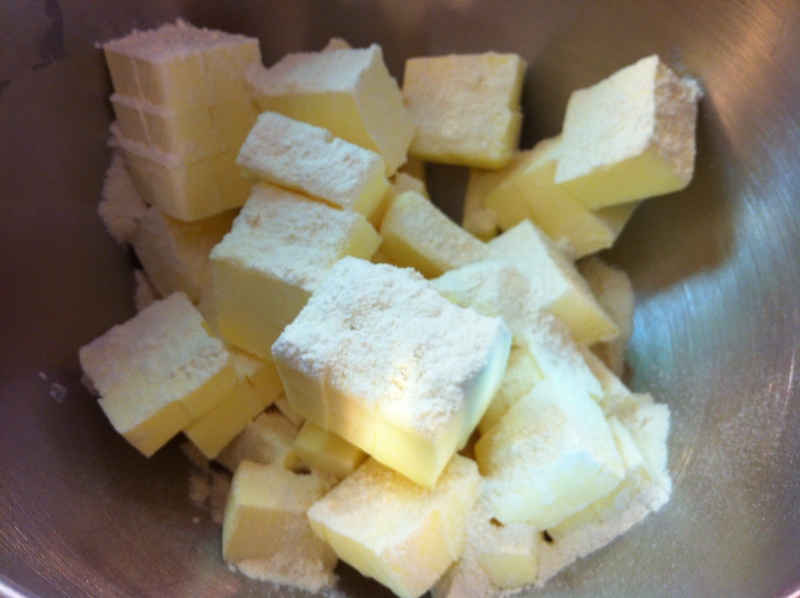 Way #2: Soften the butter slightly, cut into 1/2″ pieces, and place in a bowl. Sprinkle the flour over the butter and mix together with either your hands (the best method) or with a rubber spatula. 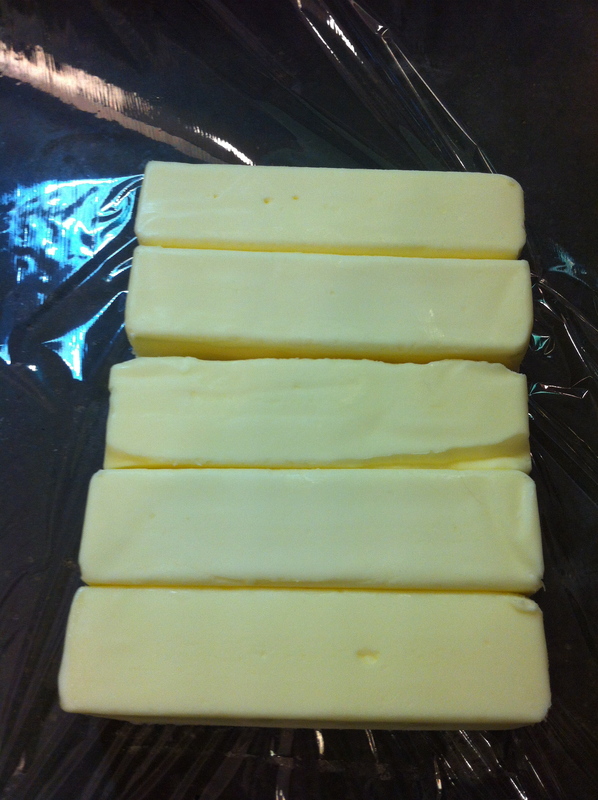 Again, wrap the butter and form into a rectangle. Place the butter in the refrigerator at let sit for at least 2 hours. For Chocolate Croissants: You make the dough the same way as you would for the butter croissants. The cocoa powder will be incorporated into the butter. 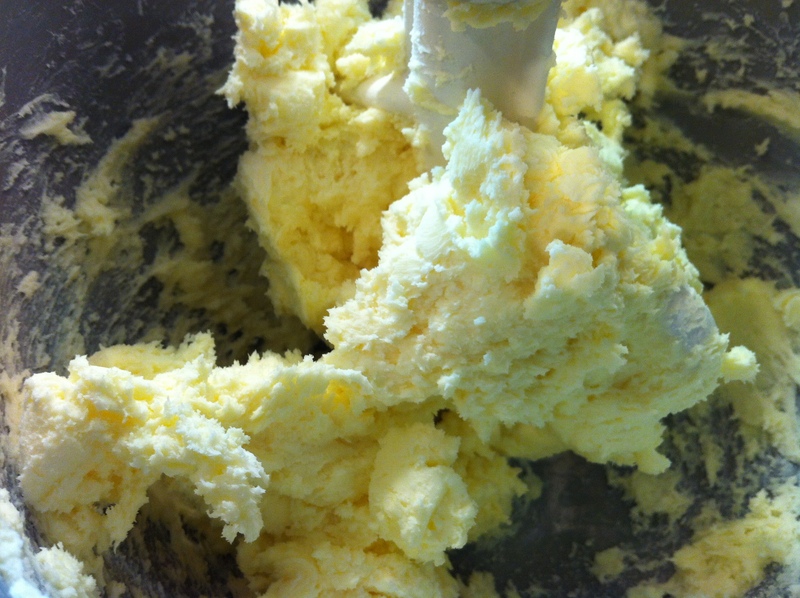 You will make the butter mixture in either the mixer or by hand (in the bowl) the same way. Butter and chocolate ready to be mixed. Let the chocolate butter sit in the refrigerator for at least 2 hours. 3. 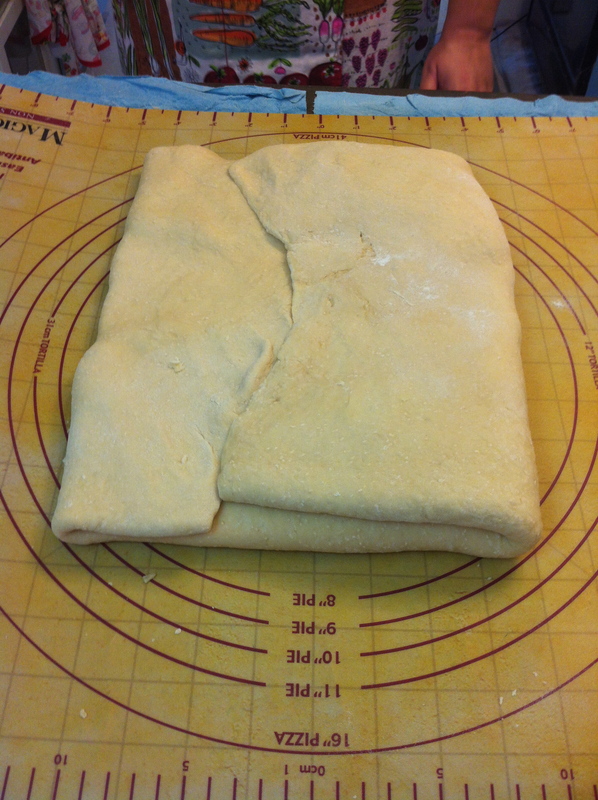 After the dough’s initial rest, place it on a lightly floured surface (cold marble or granite is ideal), lightly flour the top, and roll it out to an approximately 20″ x 16″ rectangle. (again, it’s OK if it’s not exact). Note: the dough will be a bit sticky when you unwrap it or take it out of the bag. Just flour your hands a little to keep it from sticking to you. Rolling out the dough. It’s fairly soft, so rolling it should be easy. To make sure you have the dough rolled out enough to cover the butter, place the wrapped butter in the center and fold the dough over the butter packet. At least 2 of the sides should overlap in the center over the butter. 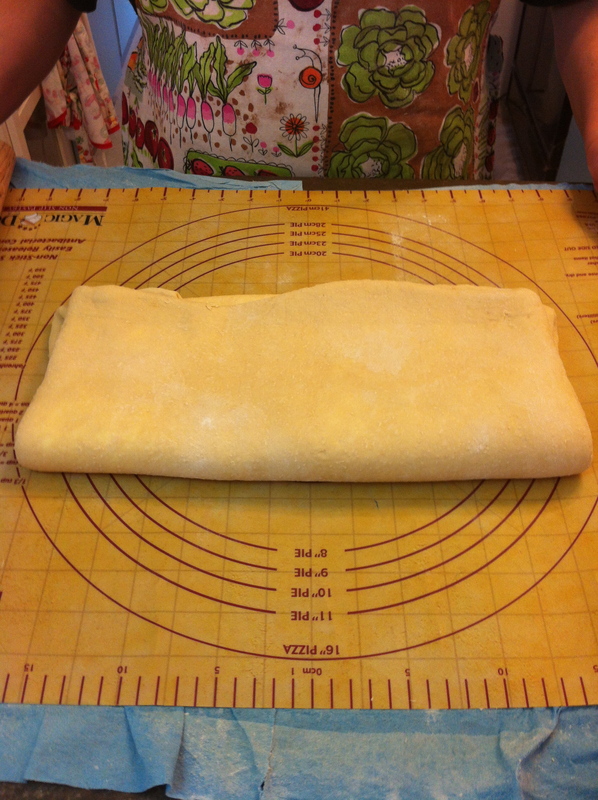 If it’s not large enough, continue to roll out the dough until it is. 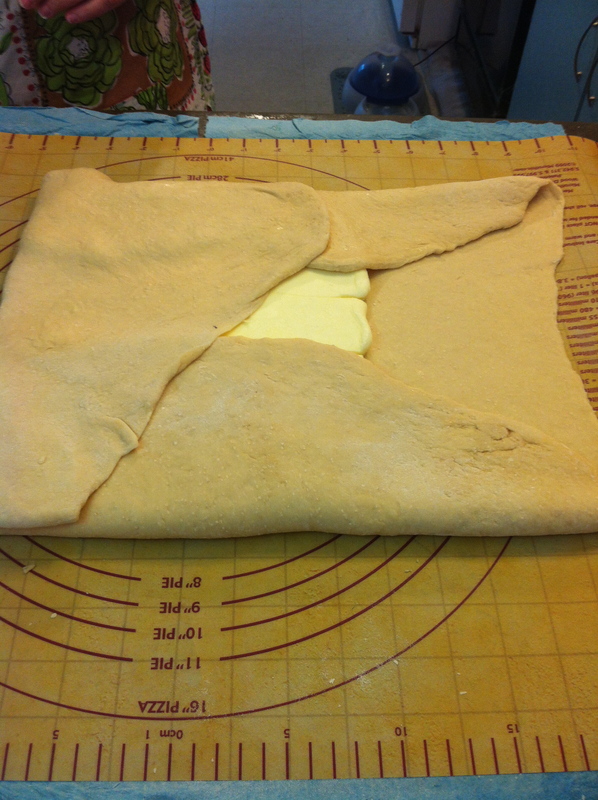 Once the dough is large enough, unwrap the butter and place it in the center of the dough. Even though it seems like common sense, be sure your butter is unwrapped before you start to incorporate it into the dough. I had a student in a class once who forgot that step. Luckily, we were able to rescue her recipe. The butter and the dough. Getting ready for enveloping. 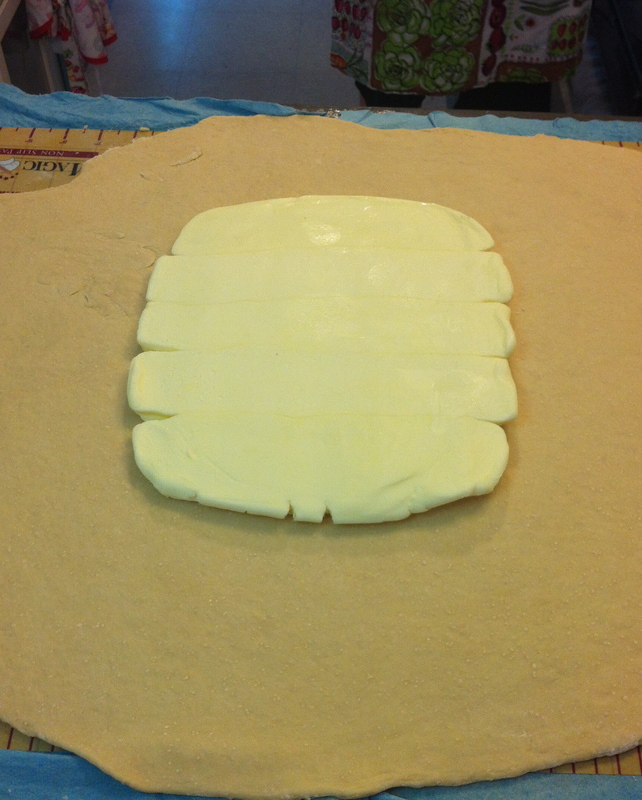 Fold the extra dough over the butter. If you have two sides that don’t meet or overlap in the center, be sure they are underneath the sides that do meet. Folding the dough over the butter. Folding the dough over the butter. Note how the dough isn’t meeting in the center. These are the sides you want to fold in first. Folding over the top layers of dough. These two sides should overlap in the center. The enveloped butter. Note how the center of the upper layers of dough overlap. This is called enveloping the butter (in case you missed it before). 4. At this point, you can either wrap or bag the dough and place it in the refrigerator to rest, or you can continue to roll the dough and do the first turn. But, if your kitchen is very warm, it would be best to let the dough rest so the butter and dough don’t get too soft. 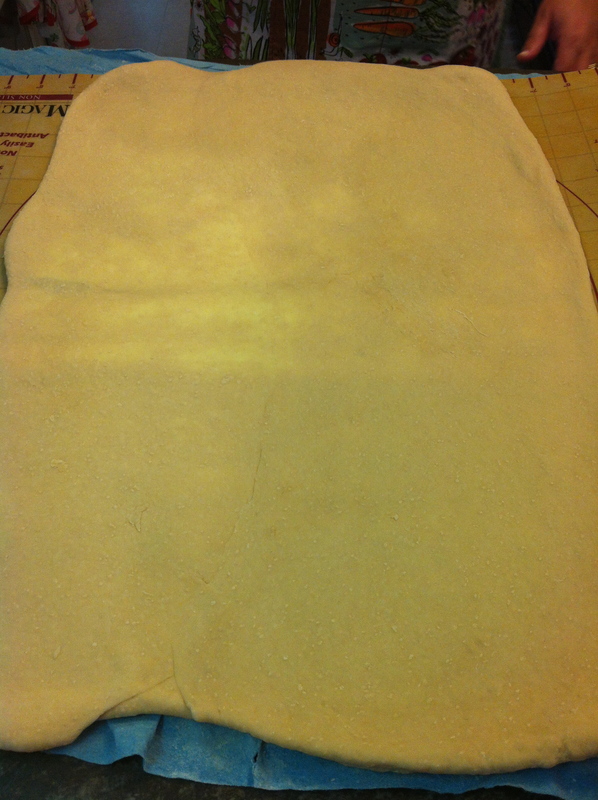 With the seam side up, lightly press on the dough to help seal the seam. 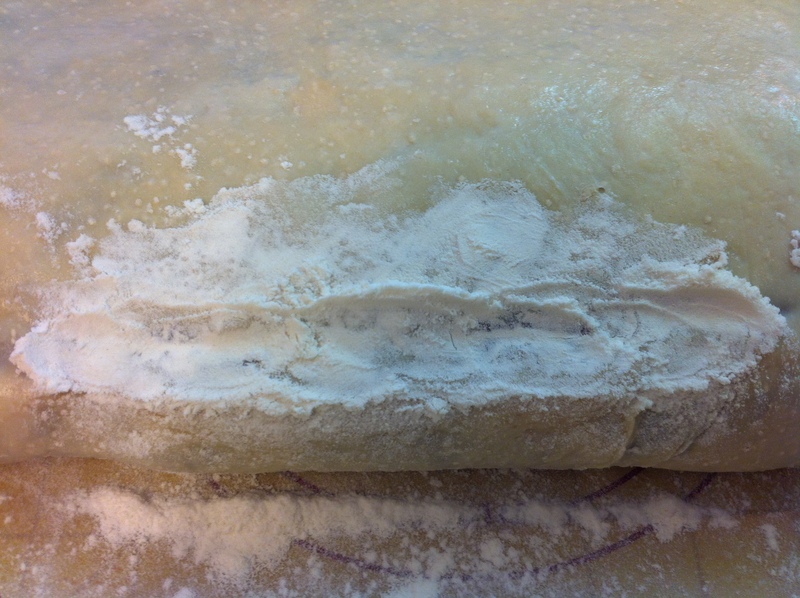 Add a little flour to your rolling surface and to the top of the dough if needed to keep it from sticking. 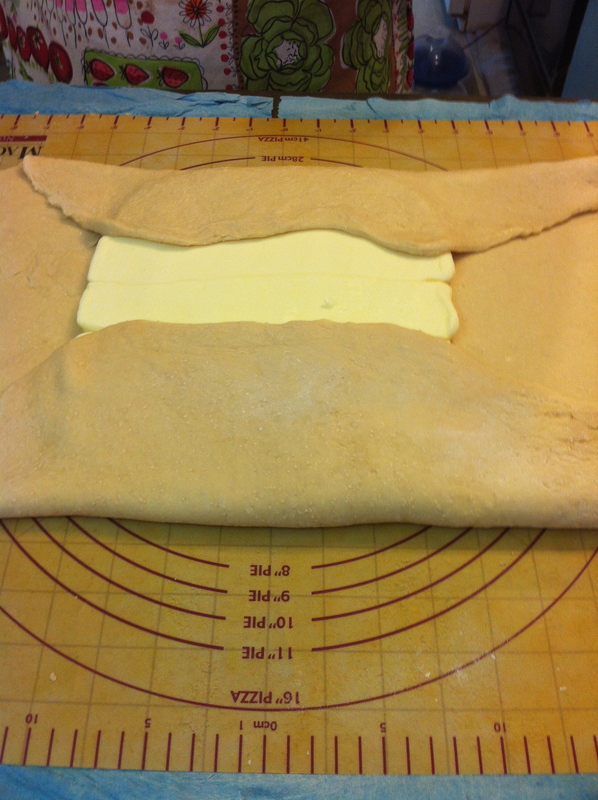 Rotate the dough and continue rolling until you reach a roughly 20″ x 16″ rectangle. Rolling out the dough and butter. Take care not to press down too hard on the dough or you will risk the butter breaking through. The rolled dough. The lighter spots are the butter. 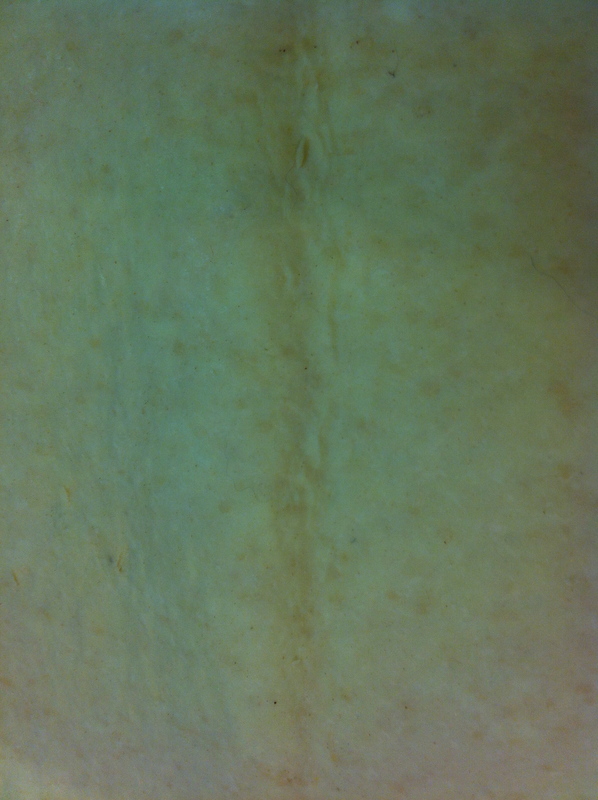 The seam is running up the center of the dough. 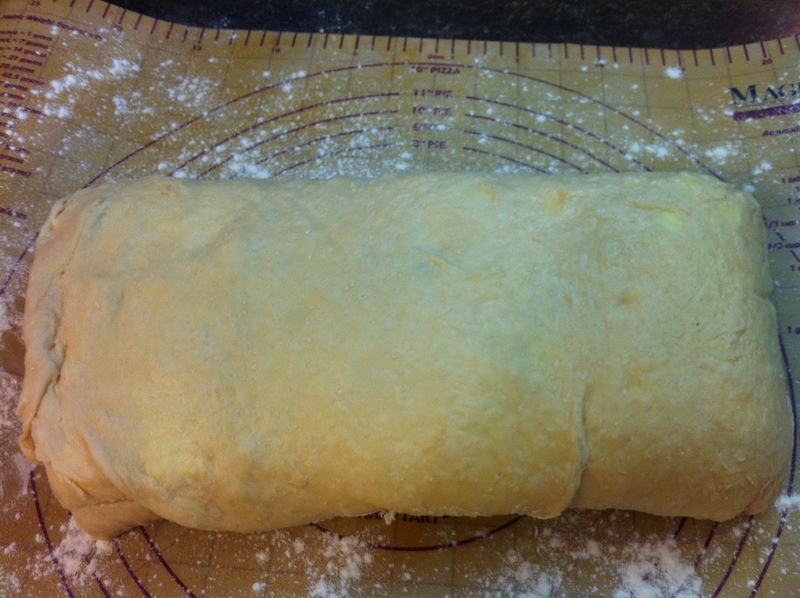 Have the dough laying with one of the long sides facing you. Brush off any excess flour. Take the left side and fold it towards the center (basically, the left 1/3). Do the same with the right side (the right 1/3) and have it overlap on the side already folded. This is called a letter fold. Folding the dough. Be sure to brush off any excess flour. The folded dough. This is the first turn. a) If the butter begins to break through the dough (which more than likely will happen, especially with the chocolate dough), pack a bit of flour into the break to help seal it. Be sure to check the bottom of the dough frequently as well because, sometimes, the butter will break through the bottom as well. Before you fold the dough and put it back in the refrigerator, make sure you brush off the excess flour. However, if the dough and butter are so soft that no amount of patching will currently fix it, then fold the dough and place it back in the refrigerator until it firms up; at least 1 hour. 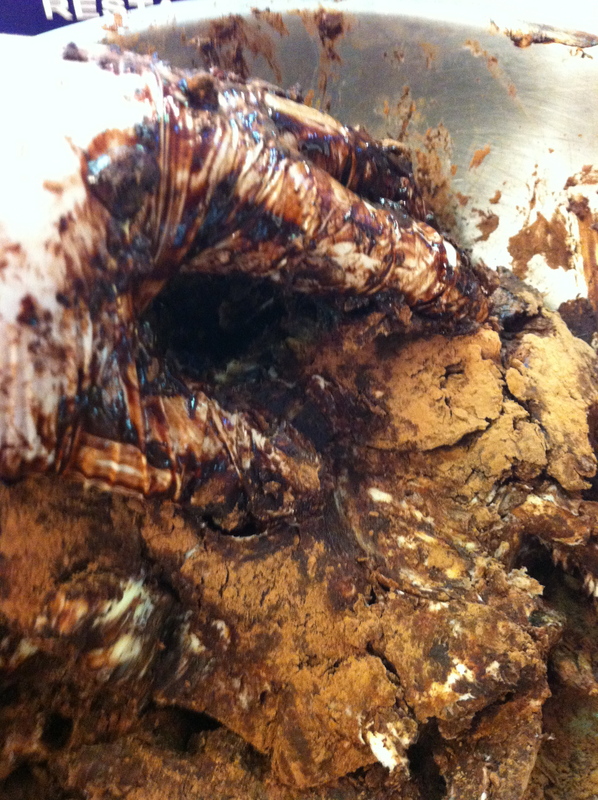 The chocolate butter breaking through the dough. Patching the break with flour. 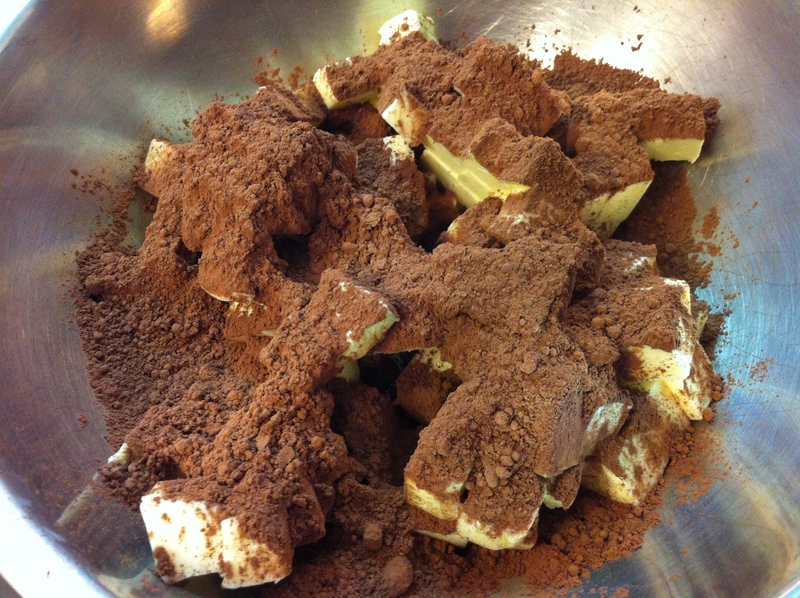 b) The chocolate dough will be a bit more difficult to roll out because the butter is stiffer due to the extra cocoa. I will generally let the chocolate dough sit for about 10 minutes before I begin to roll it out just to make it easier. 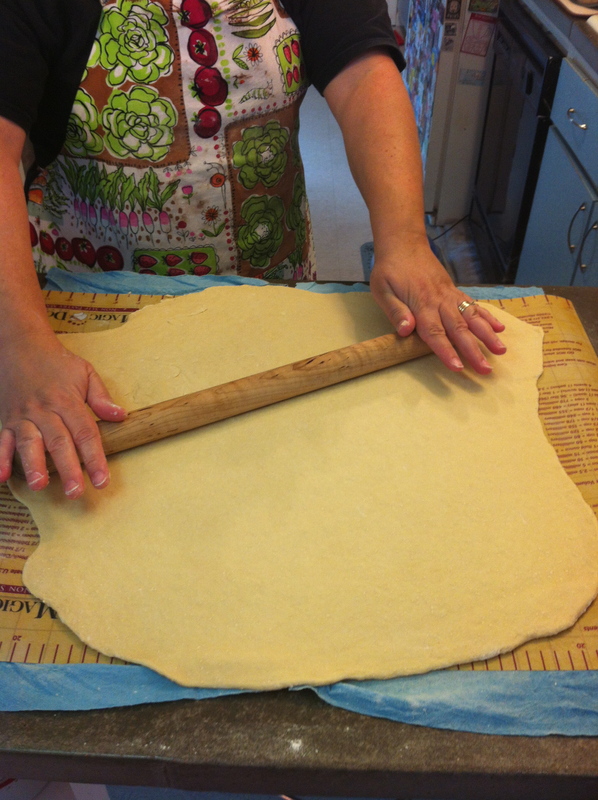 c) When you are rolling the dough, take care to only take the rolling pin right up to the edge, but don’t roll over the edge. (This is a common mistake bakers make.) If you roll over the edge, you risk having the layers sticking together. 5. 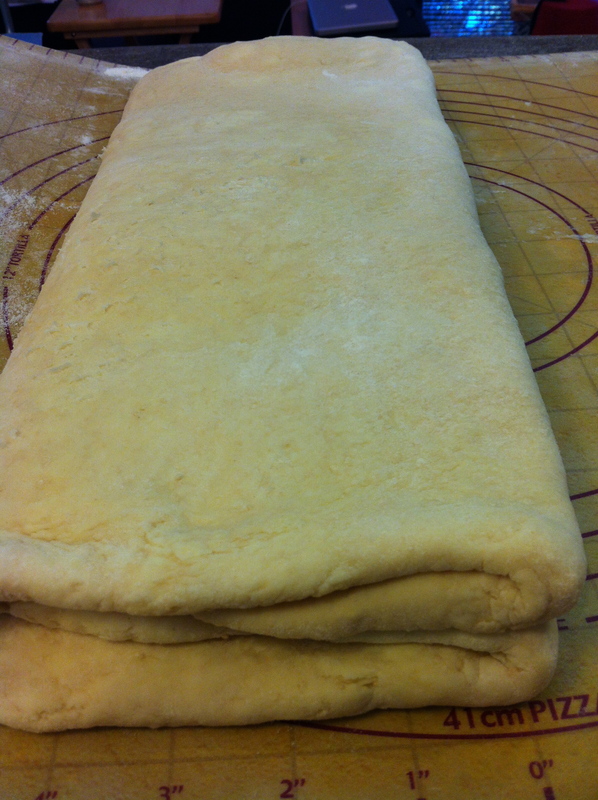 Once the dough has had its rest time, lightly flour your rolling surface, and take the dough out of the refrigerator. Unwrap or take it out of the bag. 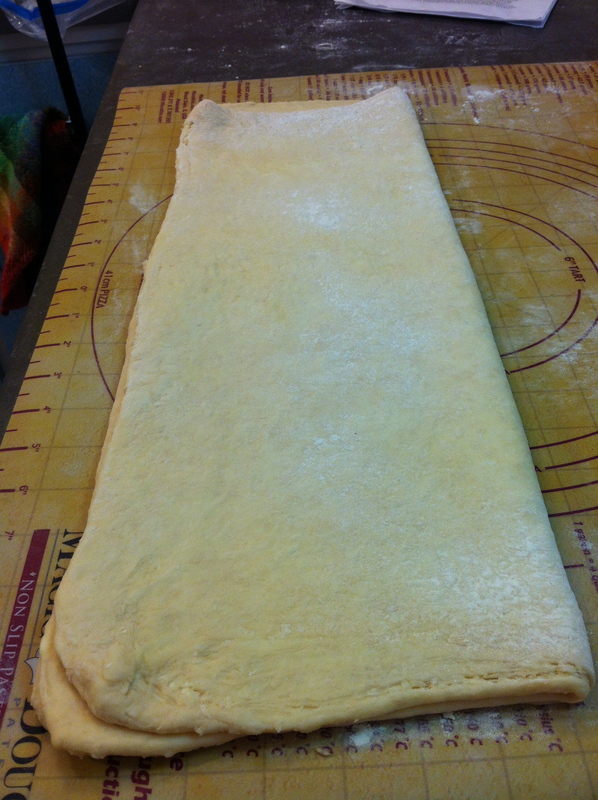 The dough, after the first turn, and after its rest time. Note how it rose again. 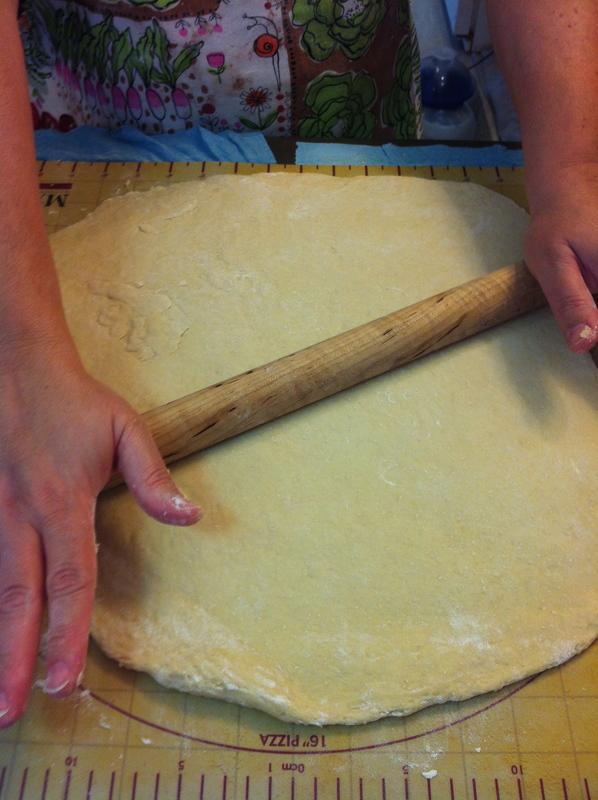 To begin rolling the dough for the second turn, have the long side facing you. 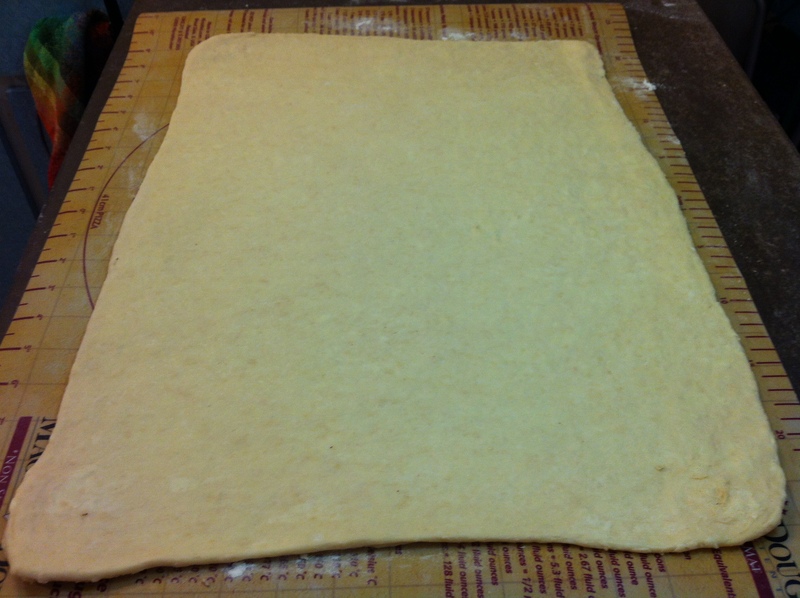 Once again, roll the dough to a roughly 20″ x 16″ rectangle and fold the dough into a letter fold. Wrap or bag the dough, and place it back into the refrigerator for at least 2 hours. Do this again a third time. These will be your first three turns. The butter dough. A close-up view. The chocolate dough. A close-up view. 6. Now for the fourth and final turn. 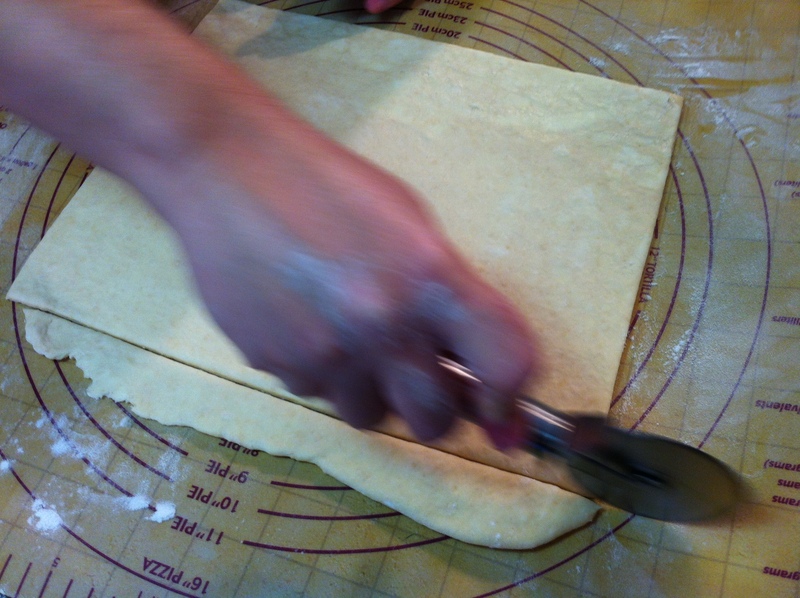 Again, roll out the dough as before and have the long side facing you. 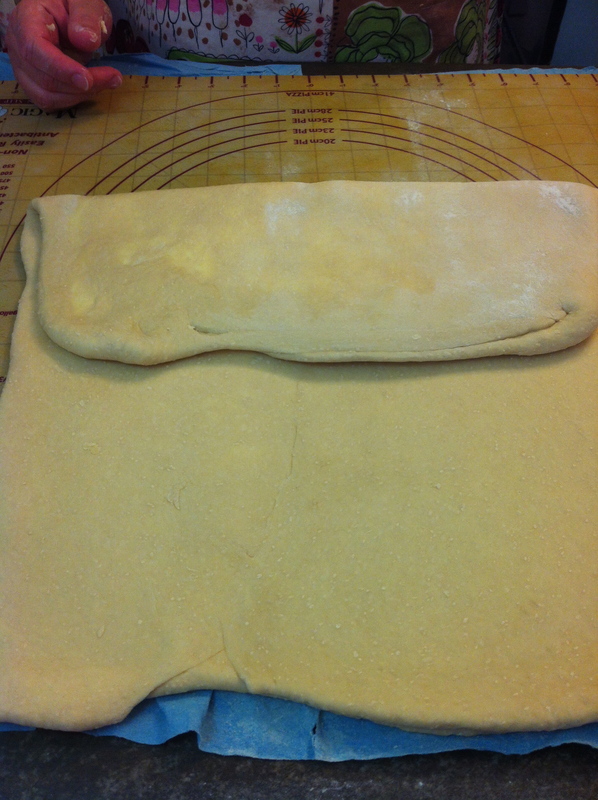 However, the dough will be folded differently. Fold the left side towards the center and then the right. Keep a gap between the ends of the dough. You will then fold over the dough. This is called a wallet fold. 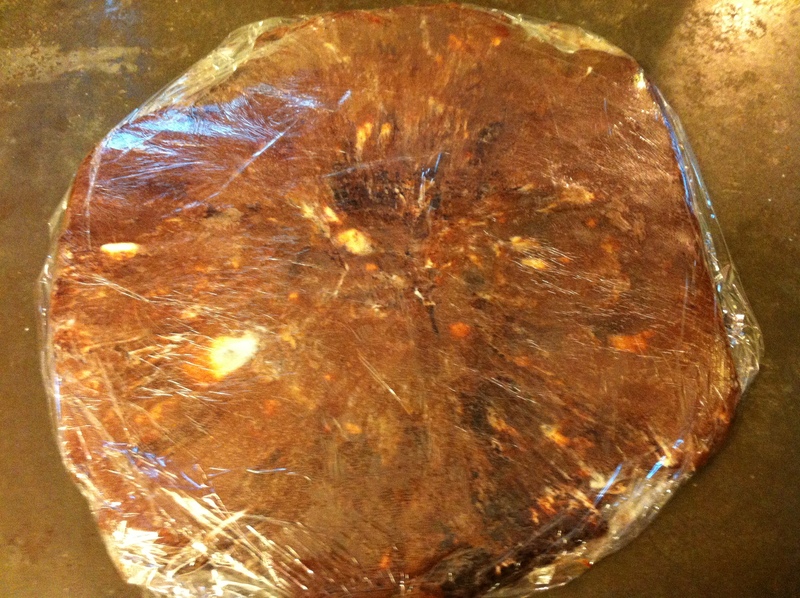 Wrap or bag the dough, refrigerate, and let rest for at least 2 hours. Folding the dough for the fourth turn. Folding the dough for the fourth turn. Note how there’s a gap between two ends of the dough. Folding over the dough. This is called a wallet fold. This is the final turn. I have been asked in classes if it’s OK to do more that 4 turns. However, 4 turns are the traditional amount. And, believe me, you really won’t want to do more than 4. 7. At this point, you can cut as much or as little of the dough as you like and either refrigerate the rest (for up to 3 days) or freeze (up to 3 months). 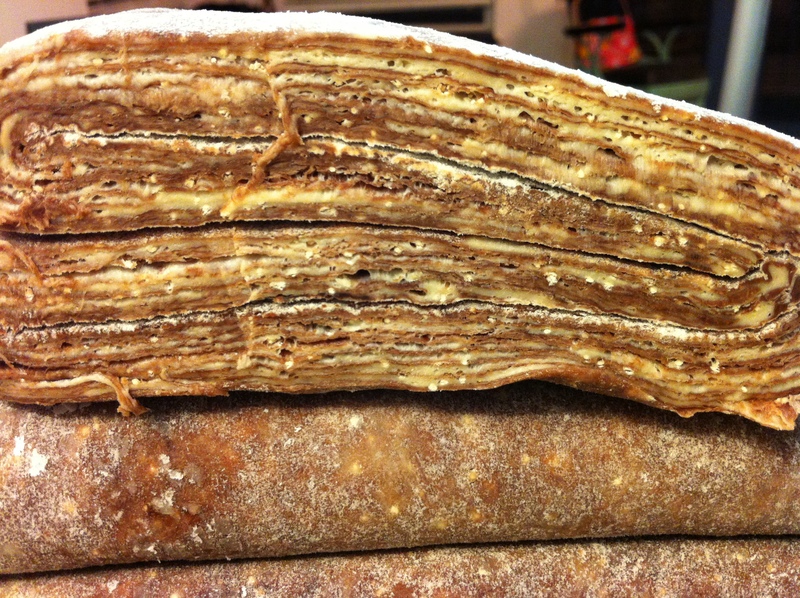 A cross section of the layers of dough and butter in the chocolate croissant dough. 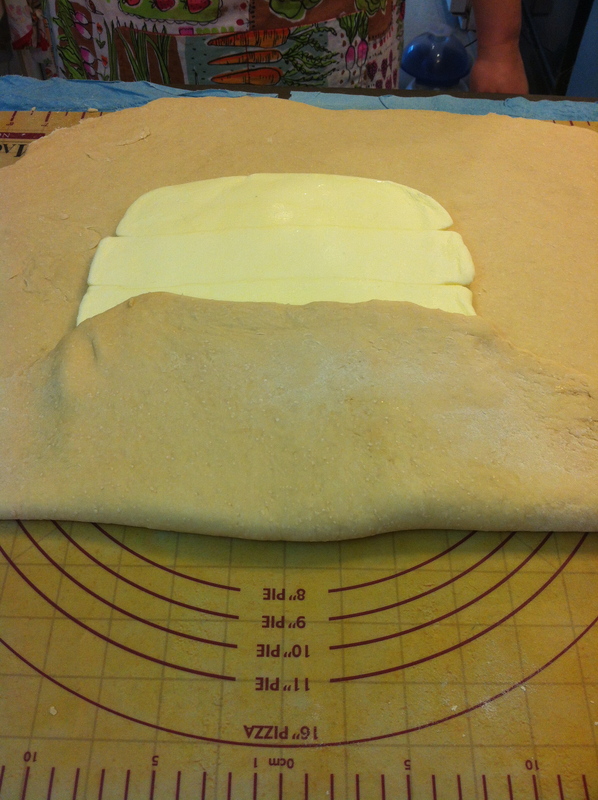 If you are rolling out the whole, well, loaf, of dough, then you’ll end up with the approximately 20″ x 16″ rectangle. 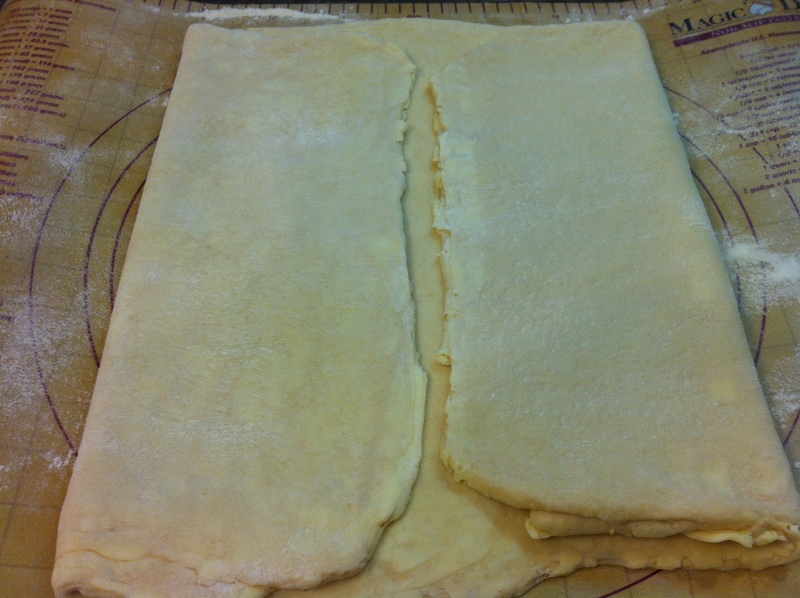 Then fold it in half lengthwise (if you want a standard sized croissants) and cut it along the fold. The rolled out dough. Ready for cutting and shaping. 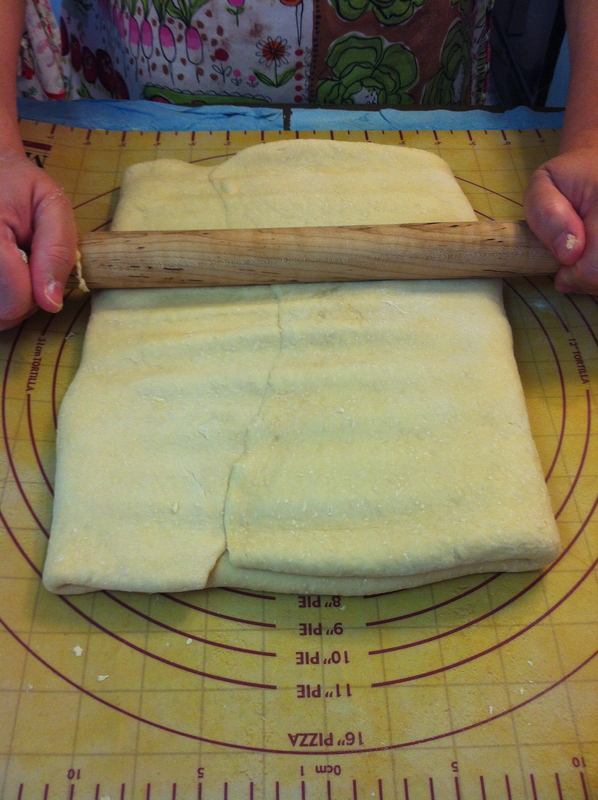 Folding the dough for cutting. It’s kind of hard to see, but there’s the fold line in the center of the photo. This is where you trim the dough. However, if you want dino-sized croissants, don’t worry about folding and trimming the dough before cutting and shaping. 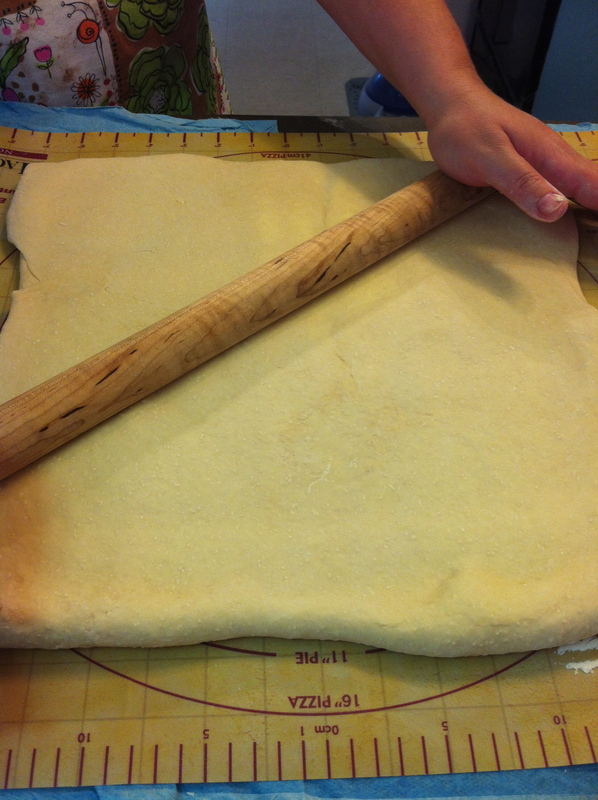 Using a very sharp knife or a pastry/pizza cutter, trim the outer edges of the dough so you’ll have clean edges. Keep the scrap pieces. I like to make cheese straws or just experiment with shapes. 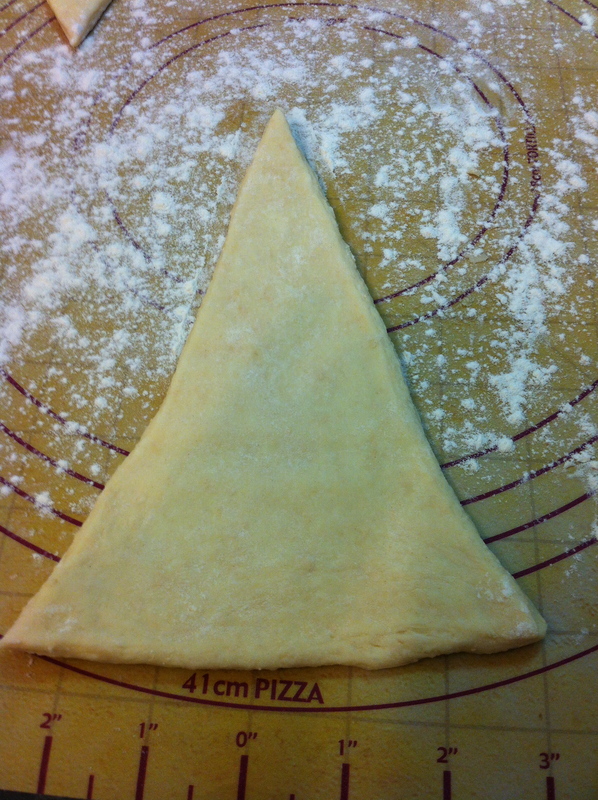 Once you have trimmed the dough, begin cutting the dough into triangles. Make them as thin or as wide as you like. The standard size is about 3″ to 4″ at the base. 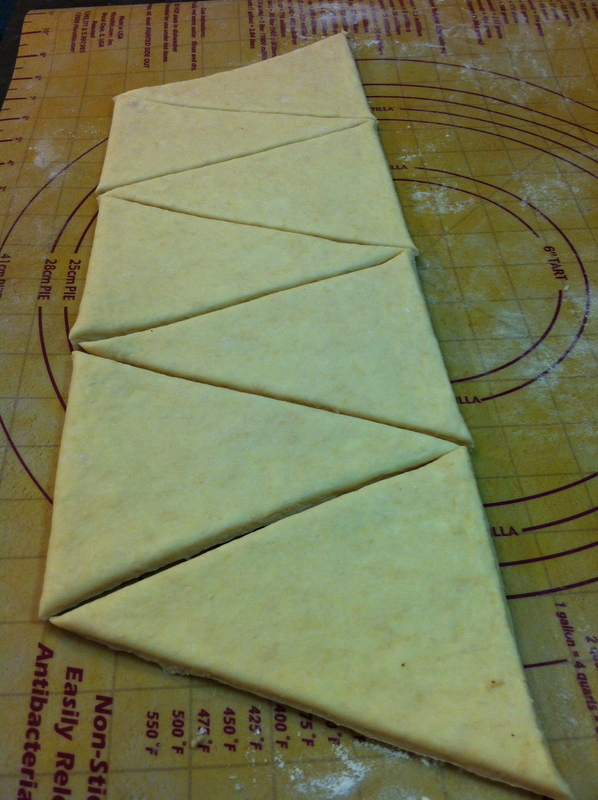 Cut triangles of croissant dough. Frankly, I’m surprised they’re as even as they are. 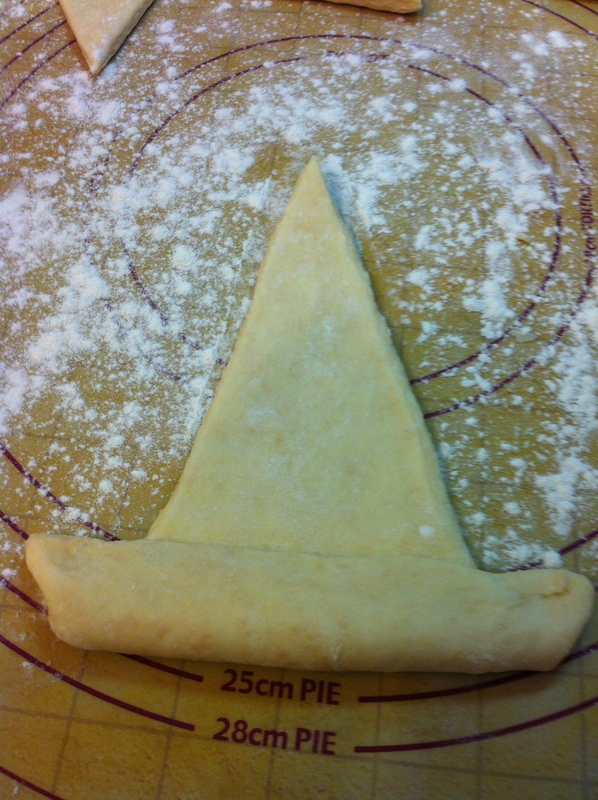 Rolling out the croissant triangle. 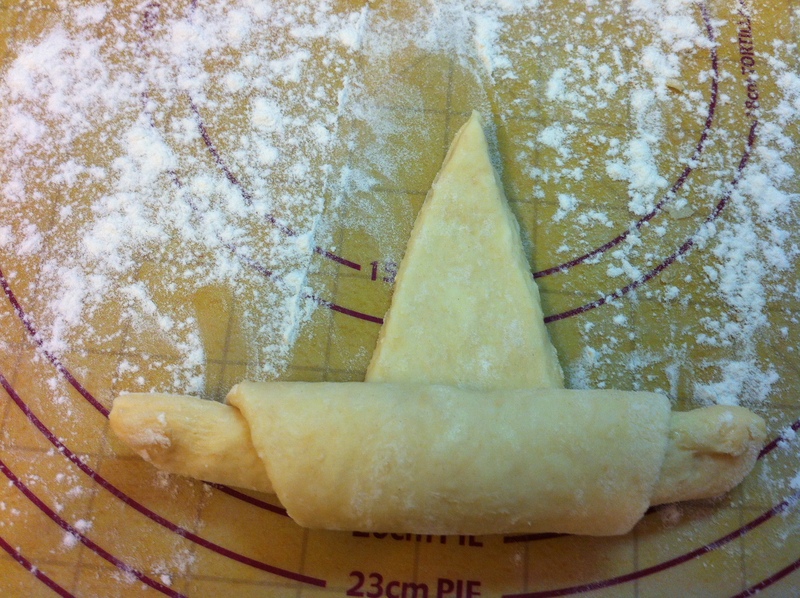 Some chefs like to place a small piece of the scrap dough at the wide end of the triangle before rolling. This helps to support the roll and give it more volume. If you forget to do this, don’t worry. I always forget. 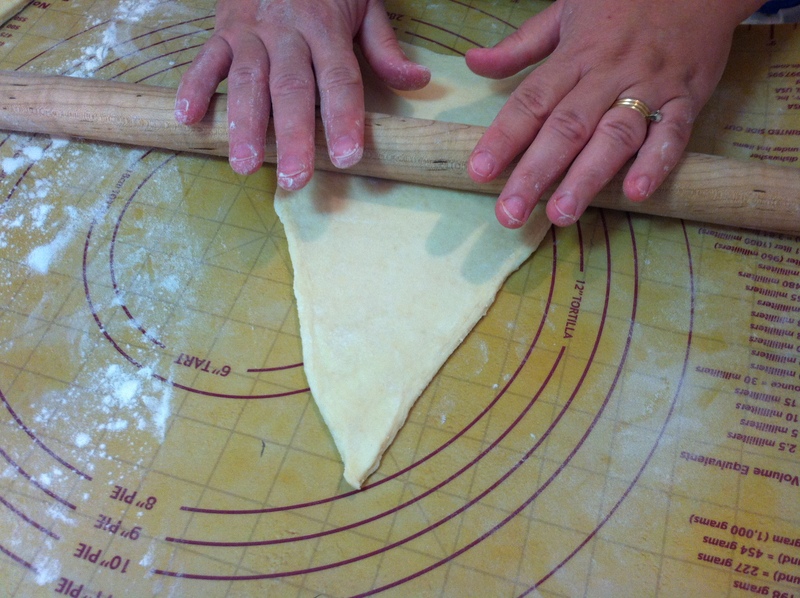 Starting at the base of the triangle, roll it until you reach the tip. Getting ready to roll the croissant. Starting to roll the croissant. The rolled croissant. Traditionally, there should be seven layers. But, I didn’t achieve that here. Oh, well. 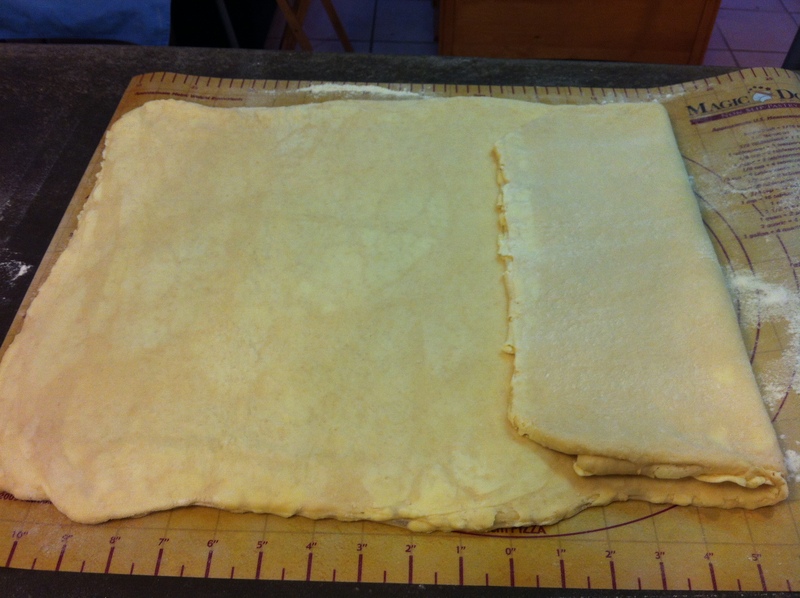 After you roll the croissant, place it onto a baking sheet lined with parchment paper. Continue until you have rolled as many as you like. Be sure the tips are tucked underneath. Brush them with egg wash (1 egg beaten with 2 tbsp. water). 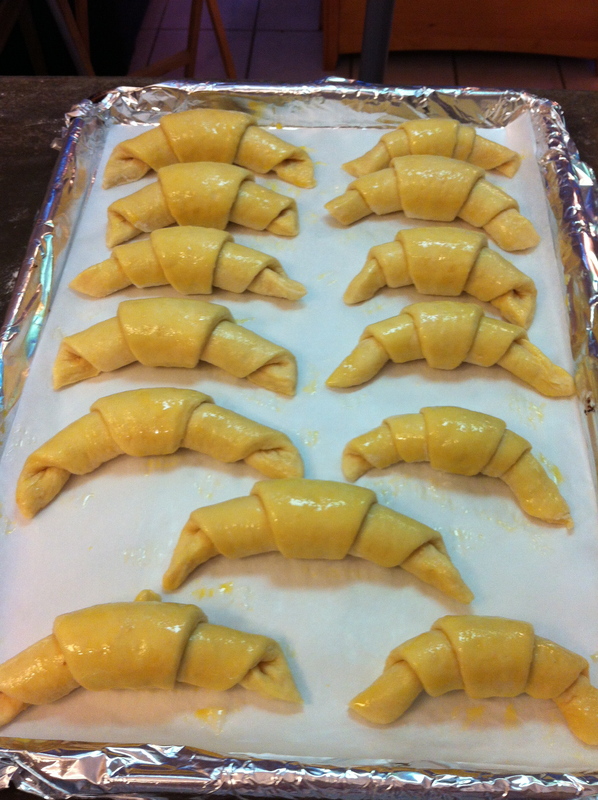 Croissants, brushed with egg wash, ready for the oven. Admittedly, there are too many on the tray. Stick with no more than 6 – 10, depending on the size of the croissant and your sheet pan. Let the croissants sit for about 1 hour before baking to let them rise. 9. Preheat the oven to 400F. Once you put the croissants in, immediately lower the heat to 350F and bake for 12 minutes. Then, rotate the baking sheet and bake the croissants for a further 8 – 12 minutes, depending on the size and the number of croissants you have on the sheet. Some butter will melt out of the dough. It’s inevitable. However, most of it will be re-absorbed by the dough. I know it’ll be difficult, but let the croissants sit for about 30 minutes before eating. The layers need time to set. 10. If you’d like to make filled croissants, there are two ways to shape the dough. You can do the traditional crescent shape. 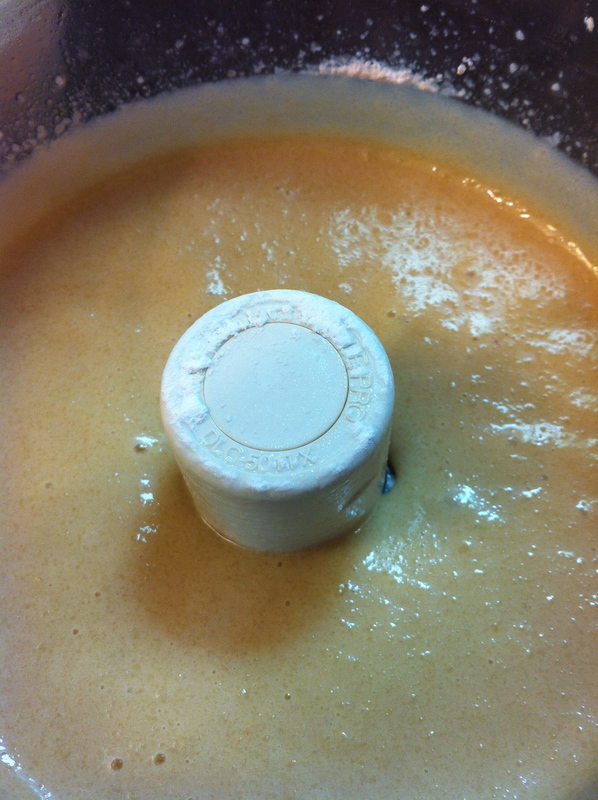 Place about a teaspoon of filling about 1/2″ away from the top edge of the triangle. 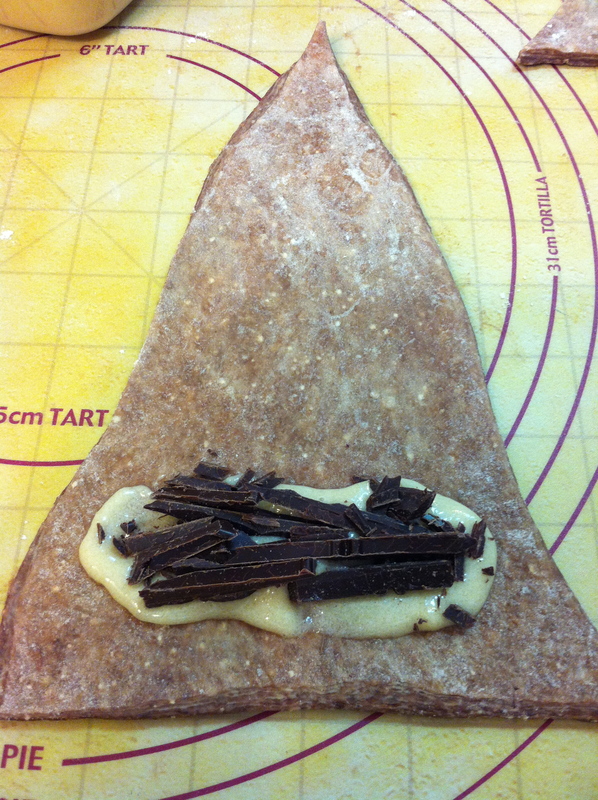 Filling a chocolate croissant with almond paste and bittersweet chocolate. Or, you can cut a piece that’s 4″ x 6″. Roll it out to 6″ x 8″. 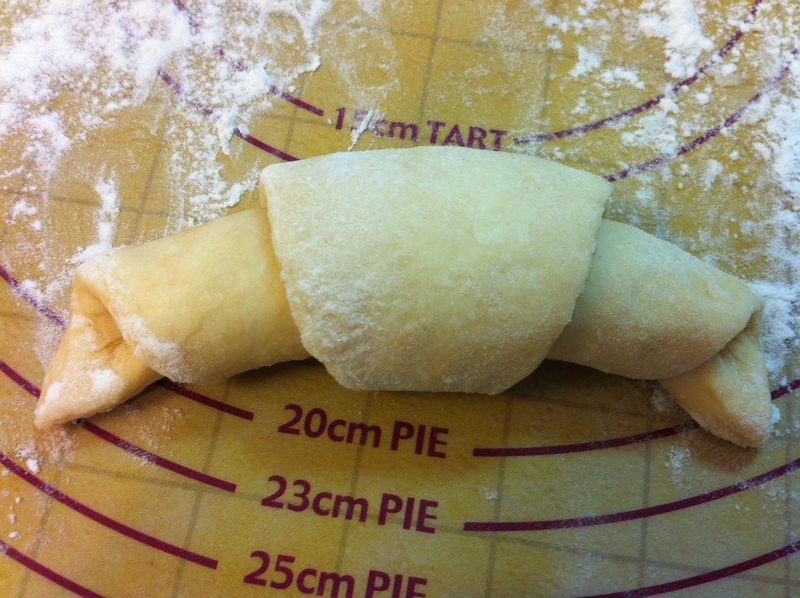 Place any filling you like inside (keep the amount reasonable; otherwise, the inside of the croissant won’t bake), tuck in the short sides first, then fold over the long sides. Place the croissant, seam side down, on a baking sheet. Brush with egg wash. Let them sit at room temperature for 1 hour before baking. One of the favorites in this house is ham & cheese. Take about 1 to 1-1/2 oz. each of ham and cheese (Gruyère is the best) and roll it into the croissant. Yummy. 2 tsp. 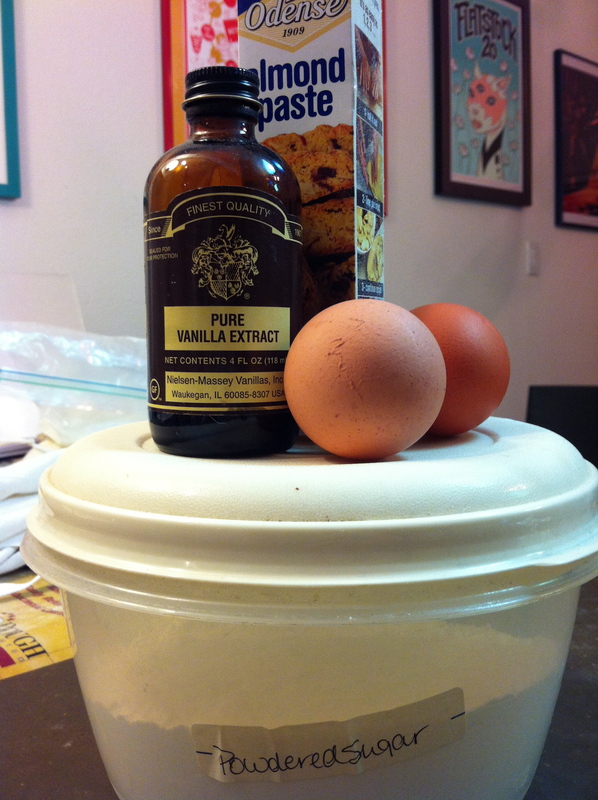 vanilla or almond extract. Break the almond paste into small pieces and drop them into the bowl of a food processor. Turn on the processor to chop the paste fine. Through the feed tube, add the egg whites and mix well. Add the sugar and vanilla or almond extract. Continue processing until smooth. It will keep in the refrigerator for a week in an airtight container. 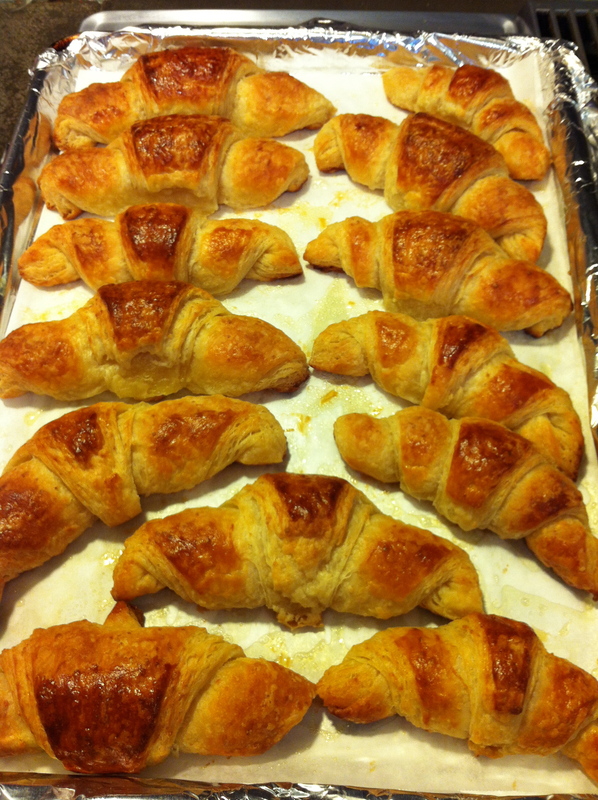 No matter which shape you choose, filled croissants must be baked differently than regular unfilled croissants. They have to bake at slightly higher temperatures to be sure the center is baked through. Preheat the oven to 425F. When you put the baking sheet in the oven, immediately reduce the temperature to 400F and bake the filled croissants for 10 minutes. Rotate the baking sheet, reduce the temperature to 375F, and bake another 8 – 12 minutes. Let them sit for about 30 minutes to let the layers set and for the center to cool slightly.